British fashion icons Alexander McQueen and John Galliano led remarkably parallel lives, from their humble origins in working-class London, to their education at St. Martins College, to their brilliant and controversial careers abruptly cut short by suicide and hate-speech, respectively. Galliano and McQueen represented the last great age of haute couture, and their tragic downfall resonates in the dissolution of fashion as high art into vulgar commodity. Gods and Kings: The Rise and Fall of Alexander McQueen and John Galliano by Dana Thomas (2015) presents a detailed portrait of both designers, as well as a scathing commentary on the commercialism of the fashion industry at the turn of the 21st Century. The lives and careers of both men are presented in exhaustive detail. Both McQueen and Galliano are depicted as enfants terrible of the great fashion houses, although the portrait of McQueen is a bit more sympathetic, perhaps in hindsight of his awful death. Their relationships suffered, even as their reputations flourished; ultimately, their personal demons and addictions, which at first sparked their creative fire, burned them to ashes. Thomas’ meticulous research is evident as the reader is overwhelmed with names and events; it’s hard to keep it all sorted, and the few pictures presented without textual references aren’t much assistance. Nevertheless, it’s a fascinating tale of ambition, genius, hubris, and tragedy, even if the reader doesn’t know much about fashion. 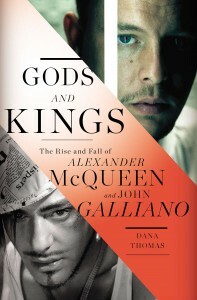 Gods and Kings The Fall of Alexander McQueen and John Galliano is available at Amazon or your local bookstore. A Post Script to the John Galliano Story, a new ending as the designer is now the creative head of fashion house Maison Margiela where he continues to provoke controversy on the runway with well received looks. Separator image Posted in Book Review and tagged with Alexander McQueen, amazon, Book Reviews, Fashion, Fashion Design, John Galliano.